Looks good and if it won't cost SE any money, better. After reading I think this is a terrific idea. Are we voting on this proposal at this time? If so my is vote yes. 1) How are blockchain cards actually purchased initially? Via new section of Merchant? 2) If I buy a Token representing blockchain Jasmine on the DEX (from another player or from unsold pool owned by the game), does that show up in my online Shadow Era account when I'm logged in within a few minutes? 3) What is the expected impact on foil pack sales and PAC sales with these new blockchain cards effectively reducing standard foils to 2nd class? 4) What kind of price are we thinking of being starting price in SHDW ($ equivalent)? 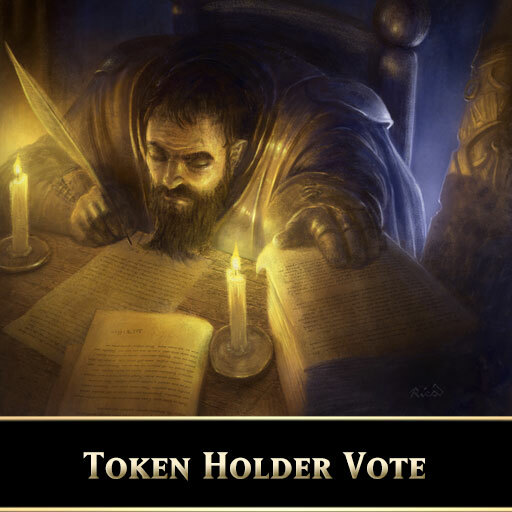 5) All proceeds of initially selling the created blockchain cards goes into Operating Pool of the game, they will all be created for free by Kyle and added into the game ready to be bought? Thanks in advance for answers. I think blockchain packs can be listed alongside the sc packs for higher visability. If somebody clicks on it without SHDW in their account then they can be sent to a help section explaining it. On the Waves blockchain, it is within 1 minute after buying that the transaction is confirmed. After that, assuming the game is still open for some reason, when the server sends the login refresh data within 5 minutes it will know that your linked Waves account has 1 Jasmine token and so add this blockchain card to your library data that it sends the game client. Same when you sell it through the dex or xfer it to another Waves address, it will be removed from your game library within 5 minutes with the login refresh, and you can't use it anymore. If you use the in-game GUI to buy the card, you will get to play with it in about 1 minute. I believe that they are in a different group of players entirely, in that whales who buy foil packs and PAC have $ to spend but not necessarily know anything about crypto or are interested in it. Similarily, new incomming crypto players might have plenty of crypto but no easy way to buy with $ from their country. It's hard to say that crypto cards are "better bling" but if so they should be priced accordingly. The prices in SHDW will be updated hourly (or whatever) to match a fixed $ equivalent. Decision on price per pack is deferred until later, will need some more thought. For example 1.5x or 2x the sc equivalent $ price of a foil pack? I don't know... Anyways once that price is set, then the starting price of each card can be set relative to that in terms of rarity, much like the gold merchant prices. Thanks for the answers, Kyle. My intention is to vote to support this. I like this suggestion, I will support it. Do we know when will this up for a vote? Voting is open now until midnight on Dec 16. I will abstain from voting. Results will be posted after voting close. So what happens if the sale goal of a particular card isn't reached? Will we get our money back? There are no sale goals defined, it was only a hypothetical suggestion that may be added later. For example, "when 500 Jasmine Rosecults are sold, we will give her an alternate art" or something like that. But at launch, each card will be available for sale. The nature of crypto is that ownership is permament and out of our control. Once you buy a card, you can trade it or sell it yourself for example on the Waves DEX. As such, there will be no refunds. I think this is a good idea. In fact, I haven't heard of anything quite similar. I'm not sure if you could patent/license any sort of technology you produce, but it's worth a thought.